Travers McLeod is the Centre for Policy Development’s Chief Executive Officer and an Honorary Fellow of the University of Melbourne’s School of Social and Political Sciences. He has worked as a Policy Adviser for the Oxford Martin School at the University of Oxford. There he focused on Now for the Long Term, the report of the Oxford Martin Commission for Future Generations, chaired by Pascal Lamy, former Director-General of the World Trade Organisation. He remains an Associate of the Oxford Martin School and holds an Adjunct position in the Faculty of Law at the University of Western Australia. 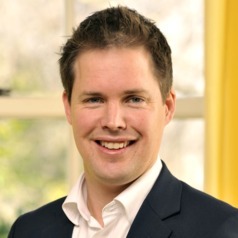 Travers has taught in Australia and the UK, including nearly two years as a Lecturer in Politics and International Relations at Merton College, Oxford. He has also worked as a lawyer and was an associate to Justice Michael Kirby in the High Court of Australia. Travers grew up in Exmouth and Perth in Western Australia, and graduated from the University of Western Australia with first-class honours degrees in arts and law. He completed a DPhil and MPhil (Dist) in international relations at Balliol College, Oxford, where he studied as a Rhodes Scholar. His first book, 'Rule of Law in War: International Law and United States Counterinsurgency in Iraq and Afghanistan', was published by Oxford University Press in 2015.